Cut chicken breast into strips. Mix yogurt, lime juice, curry powder, ground paprika, chili, beet juice, salt, cane sugar, honey, oil in a bowl to a marinate. Add chicken breast strips and refrigerate for 1 hr. Heat oil in a pan over medium-high heat and sauté the marinated chicken for approx. 3 – 4 min. until cooked through. Remove chicken from pan. In the same pan, melt butter over medium heat. Season slices of bread with salt and sugar on both sites and fry on each side for approx. 2 – 3 min., until crispy. 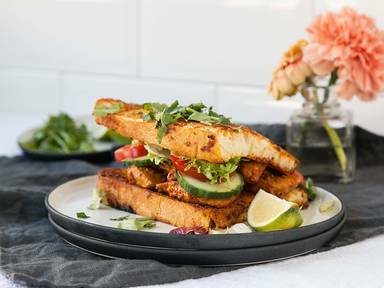 Transfer bread slices to a serving plate and assemble sandwich with lettuce, tomato, cucumber, fresh herbs, a squeeze of lime, and top with chicken tikka. Enjoy!